Nate's Nonsense: Harry Blackstone, Sr.
Congratulations to Astrocrabpuff, winner of yesterday's contest! Yes, the Person-of-Mystery was Harry Blackstone, Sr., otherwise known as "The Great Blackstone!" Magicians in many old posters were depicted with little devils and goatees (a la Joan's Mephistopheles comment), often whispering their secrets to the magicians. I'm sure the photo was posed (and maybe even slightly altered) to project this image. 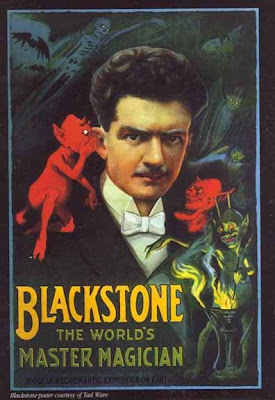 Blackstone is often considered the last of great golden-age magicians, a man who bridged the transition from the age of stage to the age of television. He performed contemporaneously with such greats as Thurston and Houdini although he was a little younger than both. Blackstone was born Harry Boughton of Chicago, Illinois. As a child he watched Harry Kellar perform a rope escape and determined to pursue the profession. 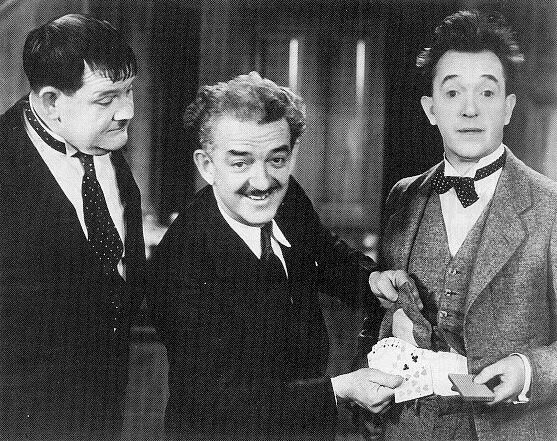 In 1904, he began his stage career, performing on the vaudeville circuit with his brother. He soon made a name for himself in his own right and was billed as "Frederick the Great." When anti-German sentiment arose during World War I, he recast himself as "Blackstone the Great" at the suggestion of his agent as they were standing in front of the Blackstone Hotel in Chicago. 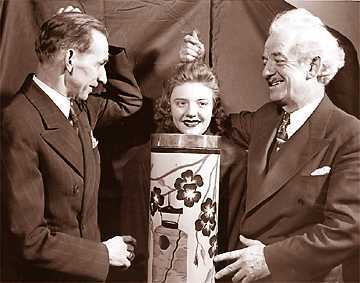 Blackstone was a master of both the slight of hand and prop magic although his skill lay with illusion. He was famous for many acts. Some of his most famous were the "Floating Light Bulb," "Sawing a Woman in Half," "Vanishing Birdcage," "Garden of Flowers," and the "Dancing Handkerchief." 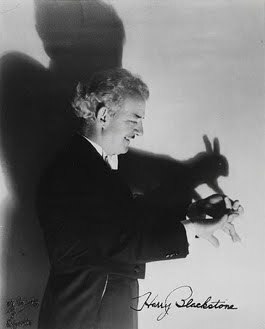 He often used rabbits in his tricks (many pulled from hats) and would give them away to children during his performances. By his own account, he estimated that he gave away at least 80,000 of the animals during his lifetime. Blackstone was very successful at bridging the era from stage to screen. 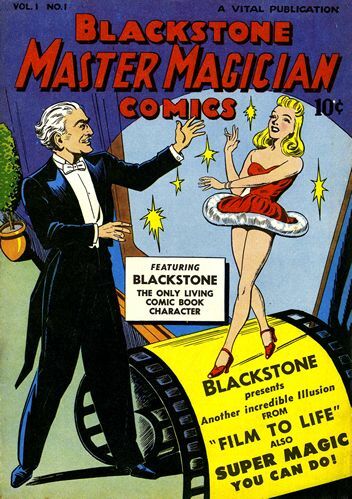 He had a radio show, "Blackstone: Magic Detective" and a even his own comic book. Many of the magician stereotypes come from Blackstone's act (think man in tuxedo with a wand pulling a rabbit out of hat and you pretty much have Blackstone). During World War II, he performed at 165 different military bases and by the 1950s he was even doing television. During the 1920s, he performed for at the White House and during the act took President Coolidge's fountain pen from his coat, pulled a rabbit from the pocket of the Secretary of the Treasury, and lifted the wallet of the Secretary of State. At the end of the performance, he made a pistol disappear from the holster of the guard on duty! Blackstone was known for his magnificent stage presence and polished performance. In 1942, he was performing a show in Decatur, Illinois, when he informed the audience that his next trick was so spectacular that everyone would have to file out of the theater and and view it from the street. He then proceeded to orderly dismiss the audience row by row. When they reached the street, they discovered what Blackstone had known - that the theater was on fire! His quick thinking was credited for saving the lives of many that night. 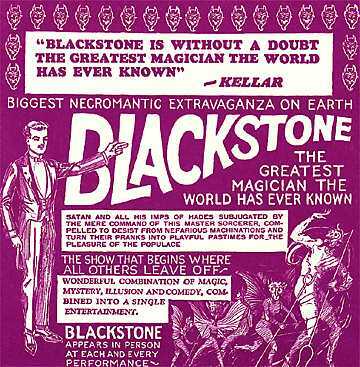 In the late 1950s, Blackstone eventually retired to Hollywood, but continued to wow fellow magicians and up and coming performers at the Magic Castle. Actually, I learn something new every day too. I couldn't for the life of me recall what those devil characters were called until you wrote about Mephistopheles. Ah, the bunny shadow is in retrospect quite ironic! I went with face at first (thus, Cronkite's eyebrows). Then the ominous shadow made me think of horror writers but it wasn't Poe. Went on a slightly different track and looked at photographers who were known to tackle interesting subjects (such as the "Jump" series of photos) when I (finally!) noticed the white tie - and realised I was looking at a performer. Who performs in white tie? Musicians or magicians. White tie + shadow = magician. committed and when you're older you begin to get credit for virtues you never possessed. It evens itself out. See the link below for more info.